We’re supposed to be good. So I found a compromise, how about a healthy granola with a little bit of something bad? Bad as in dark chocolate bad. 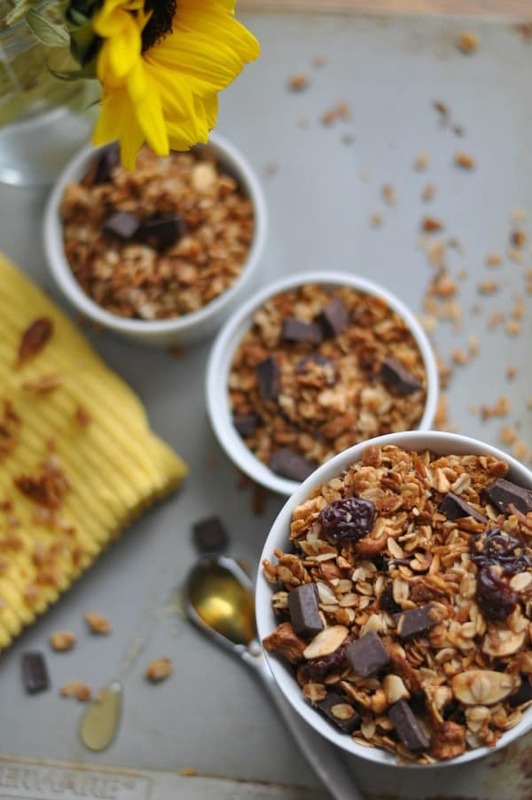 This Gluten Free Cherry Chocolate Granola is one of our very favorite recipes. I make this base granola recipe over and over again. Here’s my Homemade Granola Recipe. I change up the dried fruit and nuts and it is perfect to put on yogurt, eat like a cereal, top on ice cream or cake frosting. Oh wait. We were supposed to be good. Yes. Healthy granola and then I added dark chocolate chunks. And honey, sweet sweet honey. Remember when I told you about my Wonder Cup in my Nutella Buckeye post? 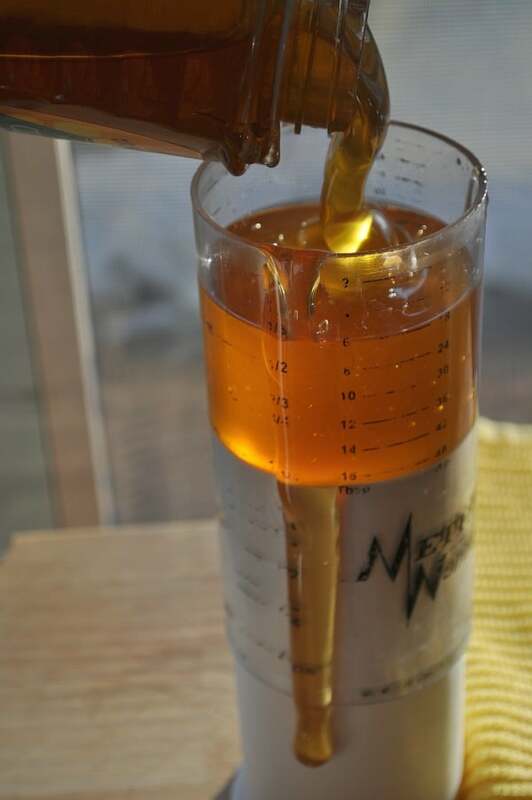 Check this out my Wonder Cup Adjustable Measuring Cup (Two Cup Size) filled with Honey! This is an affiliate link (I will receive a percentage of sales if you purchase it). I seriously love it, it is an essential tool in my kitchen and it makes measuring sticky ingredients a breeze. Especially Honey. Ok back to the granola. Now if you like breakfast for dinner as much as we do, you can add a cup of this yummy granola to pancake or waffle batter. I usually add about 1 cup of the granola to a double batch of batter. 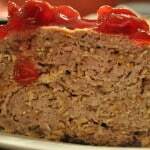 You can also add granola (without the chocolate) to meatloaf. Say what?? Seriously. 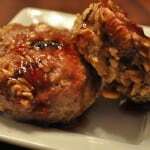 Here’s my Turkey Meatloaf Cupcake recipe. Just substitute a cup of my homemade granola in for the muesli. Don’t forget the cherry jam. This is an adapted version of Ina Garten’s Homemade Granola. In a large bowl, combine oats, coconut, oil, honey and nuts. Spread in a jelly roll pan lined with parchment paper and bake for 20 minutes, stir and return to the oven for another 5-8 minutes until golden brown (keep an eye on it, in case your oven cooks hot, decrease the time). 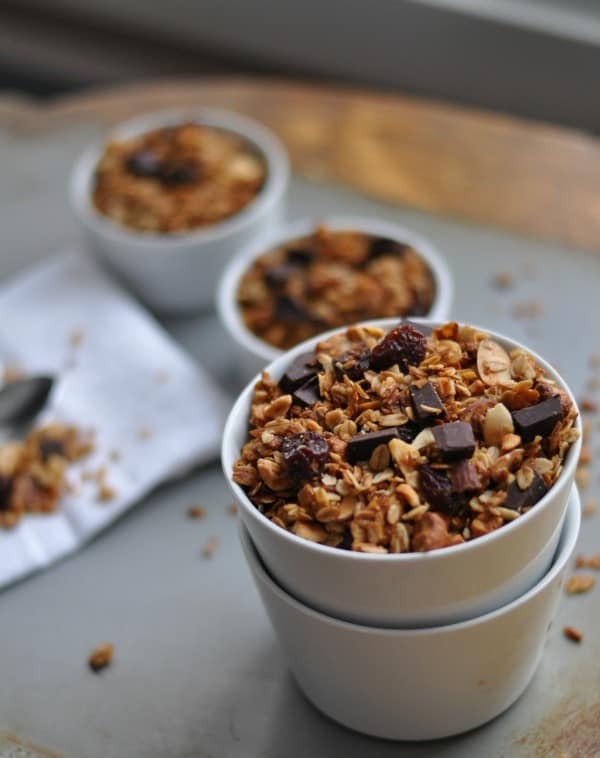 Allow the granola to cool and then add dried fruit and chocolate. 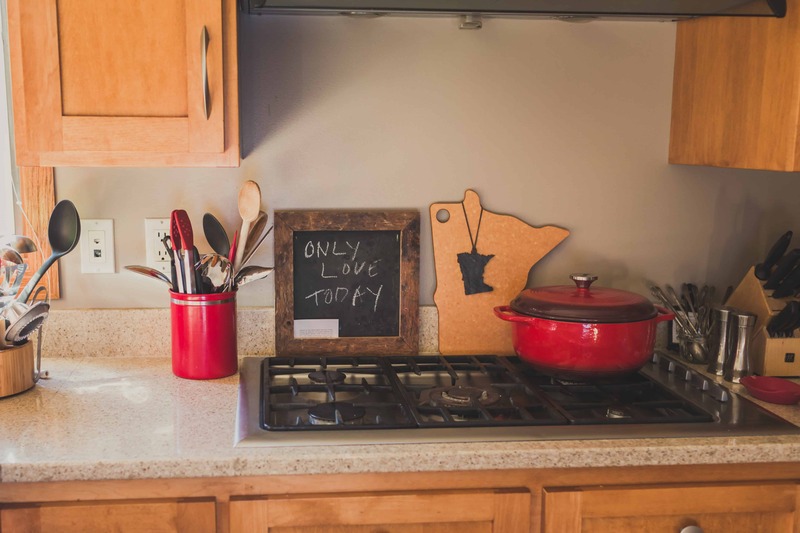 This entry was posted in Breakfast, Twin Cities Live and tagged breakfast, gluten free, granola by Alice Seuffert. Bookmark the permalink. This will be my next granola recipe! It looks so wonderful! Yumm!! I love homemade granola and this looks soo good! Thanks Tiffany, it’s one of our favorites! Looks really yummy…will have to give it a try! Yumm! I loveeee granola. this is a must try. Thanks, Brenda! It is a must try! This looks so yummy 😀 thanks for sharing!! Thanks for stopping by Brittney! OH my gosh… my mouth is watering! This sounds so ridiculously good! Thanks so much friend! It is one of Will’s favorites! Thanks for the feedback on my photos-working on it! Yummie!! This is exactly the type of recipe I have been looking for! Pinning for later! Thanks Tara! So glad you like it! And thanks for pinning! This looks fantastic. 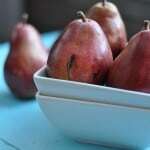 I love snacks that have a little bit of sweet in them and this sounds perfect. Definitely pinning this one. I agree, love having just a little sweet! Thanks for pinning! Um, YES you’re speaking my language! 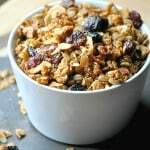 I love granola and think adding dried cherries to it sounds awesome! Thanks, Haley! We love granola in our house too! The chocolate and cherries makes it an extra treat! 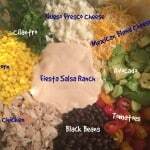 This looks yummy, healthy and so easy to make. I really need to try it. Thanks Caroline! 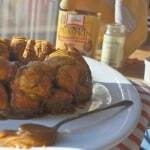 It is so easy and yummy!